A home in the city is the stuff of dreams for many, but building within a preexisting, dense infrastructure requires special effort, from diplomacy with zoning boards and neighborhood associations, to finessing the design challenges of light and privacy, to designing within a tight footprint. If you’re working on an old building, conversions and renovations come with a laundry list of challenges that may involve historical preservation, narrow lots, scheduling trades, and collaborating with planning and zoning boards and neighbors. It’s almost guaranteed that the home will be virtually rebuilt. Factor in legal expenses related to planning and zoning, and it’s easy to see why some builders shy away from such projects. As with any custom-built home, the best results come when you address planning and zoning issues and neighborhood concerns early on, especially if any aspect of the construction veers from design-review guidelines or may be disruptive. Architects offer their insights in the story section below with the headline "Penciling Out: Approvals." Nestled in Chicago’s scenic Lincoln Park neighborhood and surrounded by boutique restaurants and shops, this 4,800-square-foot townhouse had all the charm of the historic-looking three-flat homes that the city is famous for, including an intact brick and limestone façade with metal cornices. Owner and designer Jessica Supera bought the 1886 building but knew that the interior—previously three apartments—was unworkable for her husband and children. Maintaining the classical proportions of a Chicago townhome while making the interior contemporary involved several major design moves, including connecting the kitchen to the family room and the outdoors and adding generously-sized windows to the rear elevation, essentially rebuilding it. “I had this Brooklyn brownstone fantasy, and I loved the street and the neighborhood,” Supera says. She hired Chicago-based Goldberg General Contracting (GGC) and local architect Seth Romig for the historical conversion/adaptive reuse project. Supera wanted “classic with a twist.” The classic part: retaining the building’s architectural bones; the twist: a lot of light. 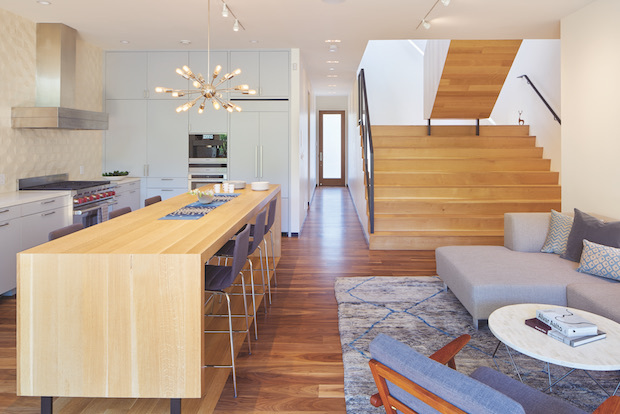 Romig, who’d previously worked on a three-flat historical conversion in Chicago’s Bucktown neighborhood, was up for the challenge of transforming a 22-by-62-foot structure on a 25-by-125-foot lot into a five-bedroom, five-bathroom home for one family. The harder question was, “What pieces of Chicago can we keep to elevate this house into something special?” Romig says. The plan was to save the façade and to essentially rebuild the home, adding new windows. One of Supera’s pet peeves is windows that face brick walls, an often common predicament for Chicago three-flats and rowhouses, as well as many city apartments. One of GGC’s VPs, Jeff Berry, who led the project, removed all of the original windows and installed a 7-by-16-foot skylight. Because the neighborhood isn’t designated as historic, Romig had no difficulty getting the project through permitting, which in Chicago is largely done online. Supera and Romig agreed that staining the red brick façade a dark color would unify the façade while setting it apart from others on the block. 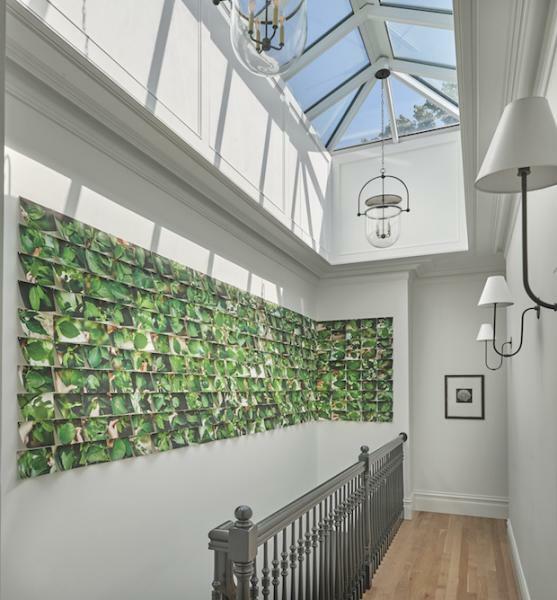 This skylight brings in natural light from the third floor, a modification that was needed as a result of removing the original windows facing the neighbors' brick walls. GGC essentially gutted the building, rebuilding the rear façade with full-span windows running the width of the house on all levels. The team excavated the basement so the ceiling would be 8 feet 4 inches high. The grade level in the backyard was lowered to allow for a walkout basement, leading to a patio, breezeway, and the 22-by-20-foot garage, which has a party deck above it. The spot for the garage, which was built last, served as the staging area for the backhoes during construction. The yard was shored up with steel sheet pilings before the concrete retaining walls were built and clad in masonry. Digging out the backyard was Supera’s idea. She was inspired by an image she had seen of a New York brownstone with a walk-out basement. But recreating that basement on a narrow lot so it didn’t disrupt the neighbors was a challenge. 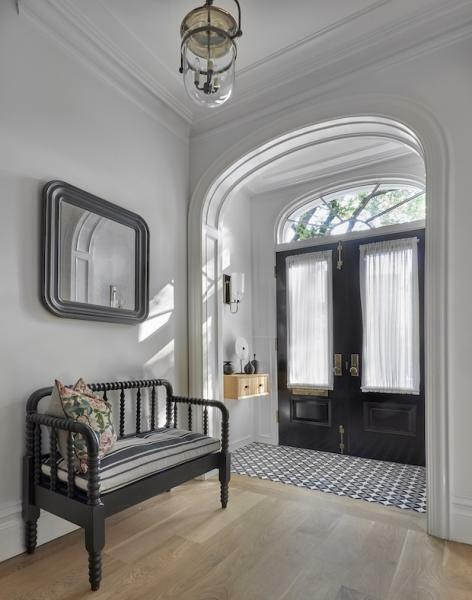 Inside, Romig knew he wanted to capture “the classic essence of the building in a proportioned way.” He retained the building’s vintage charm with a pair of raised-panel French entry doors with beveled glass, echoing the door with a half-oval arch inside. “We wanted a formal foyer to transition between the interior and exterior,” he says. “The interior arch detail reinforces the formality and importance of that threshold between the interior and the historic front façade.” Even the layout has the “twist” Supera sought: The designer’s office is located in the front of the home, near the entrance, where a living room would usually be. 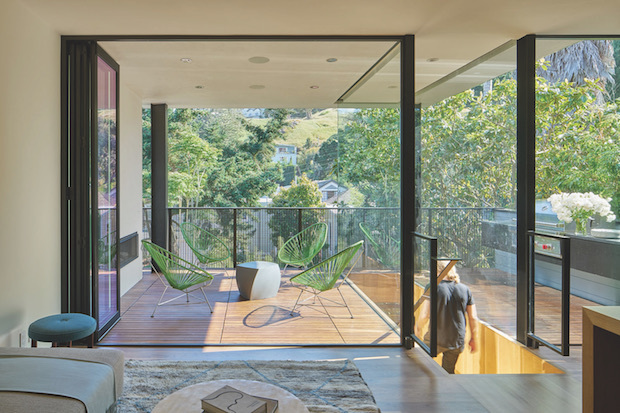 The clients for a project in San Francisco’s Noe Valley are long-time residents of the city who were moving from a condo to a house. They knew they wanted to stay in the neighborhood—a popular, lively one, with trendy restaurants and boutiques. The couple bought a dilapidated 850-square-foot Queen Anne cottage in a part of the neighborhood with many traditional Victorian homes. They wanted a contemporary design but also appreciated the charm of the existing cottage and the street. And they knew their plans could take awhile to be approved, given the city’s lengthy review process. Local firms Schwartz and Architecture and the construction firm of Gelling & Judd took on the project, which involved rebuilding the existing cottage as well as lifting it to insert a two-car garage beneath. While the 1908 cottage wasn’t considered a historic resource (any building more than 50 years old and possessing architectural or historical significance is a candidate), it still had to meet the city’s demanding zoning and planning design-review guidelines and get the neighbors’ approval. Early on, the design was limited by the city’s planning department. Rebuilding this Queen Anne cottage involved constructing a modern rear facade. It took a year just to get permits, and the project itself took three years from start to finish. 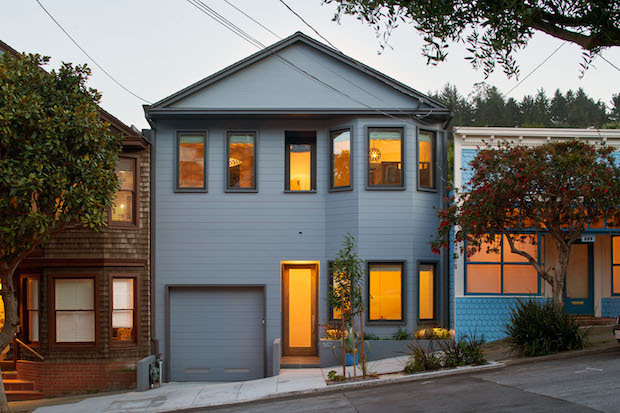 The lot was just 25 feet wide—typical of the city’s narrow urban parcels—and Schwartz had to build the house with a series of setbacks mandated by San Francisco’s Planning Department: a 3-foot-wide setback on one side, and a 5-foot setback on the other. These uneven setbacks cut up an already narrow space, forcing Schwartz to go vertical, adding height to the rear elevation. One neighbor, who lives more than a block away, objected to the building’s height, which was actually lower than the 40-foot height limit, Schwartz says. The neighbor’s objection was overruled because he was outside the required radius for notification. Schwartz recalls that, after plans and drawings were first submitted, entirely new setbacks were demanded by the review committee, so he and his team modified them. But the neighbors on both sides of the property had signed off on the original setbacks, and they then objected to the new ones, leaving the design team caught between what the city wanted and what the neighbors wanted. More adjustments were made. 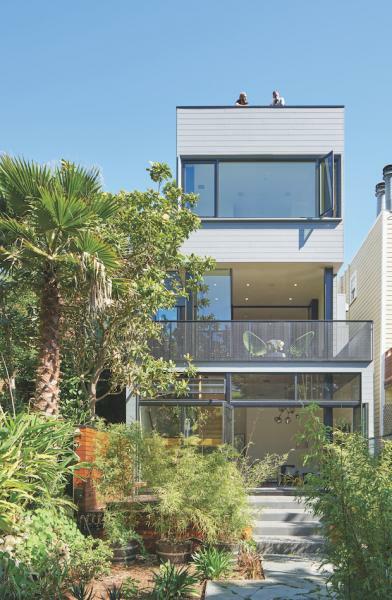 Challenges abounded in a San Francisco home on one of the city's typical 25-foot wide lots. The entry and kitchen are at stree level. Stairs run from the lower garden level to the roof deck , and the home gets narrower as the ascent progresses. “We thought that maintaining the cottage feel would bring an easier review process, but in the end, I’m not sure that was the case,” Schwartz says. Though a total tear-down probably would have been easier and less expensive, he notes that “the surprise factor of entering the front door and discovering this very different world at the back” is a design feature that ended up delighting everyone. From the street, the house—now 3,500 square feet—appears to be a traditional, two-level home in keeping with the neighborhood vernacular. But seen from the back, the rear elevation is three levels, plus a roof deck, and is completely modern, with steel beams and glass walls. The front and rear look like two entirely different homes. Upon entering the home from the street, lush greeney at the rear is fully visible, thanks to modern rebuilding with abundant glazing on the back wall of the house. The house, widest at the street level, gets narrower as you approach the top, due to the setbacks. The entire top floor is just 16 feet wide. The master suite is in the new portion of the home, behind the raised existing cottage. Adjacent to the kitchen is a covered deck. In keeping with the downward sloping site, stairs lead to the lower garden level and family room, which connects to the garage. Whether you’re building in a city on the East Coast, West Coast, or in the Midwest, historical buildings can present special challenges. An experienced architect, as well as strong relationships with zoning boards and neighborhood groups, can expedite the approval process, save money, and may just help keep the project on track. 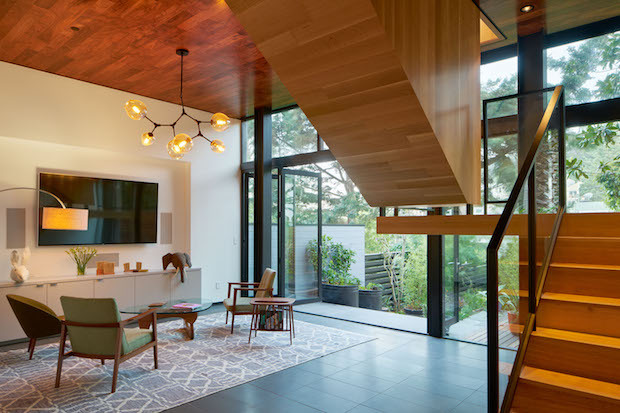 Builder Sean Ruppert, principal of OPaL, in Cabin John, Md., and architects Neal Schwartz, in San Francisco, and Seth Romig, in Chicago, have experience with historical conversions, adaptive-reuse projects, and in historical districts. San Francisco and Washington, D.C., have lengthy permitting procedures, which sometimes even culminate in televised public hearings. In contrast, Chicago’s permitting is entirely done online, with public hearings held by the city’s historic preservation division to determine landmark status. 1. Hire an experienced architect well-versed in planning- department regulations and the design-review process. For example, a seasoned Washington, D.C., architect knows it takes three months to get an appointment with the historic preservation review board staff and six months for permits. 2. Develop good relations with planning entities. Ruppert has done this with the District of Columbia’s historic preservation review board, which includes historians, architects, an archaeologist, and at least one citizen. 4. Hire a good zoning-law attorney for larger projects to represent your interests at public hearings. “When you’re dealing with that kind of money, you don’t just want to talk off-the-cuff,” Ruppert says. Legal fees can range from $50,000 to $70,000, which includes pre-hearing discussions with board staff and vetting different incarnations of drawings. Sometimes it’s less for smaller projects. 5. Get involved with area groups to shorten and simplify the permitting process. Schwartz is the founding chair of a committee focused on policy and advocacy for Bay Area architects with San Francisco’s chapter of the American Institute of Architects. Planning boards nationwide can be influenced by neighbors who may be affected by construction. 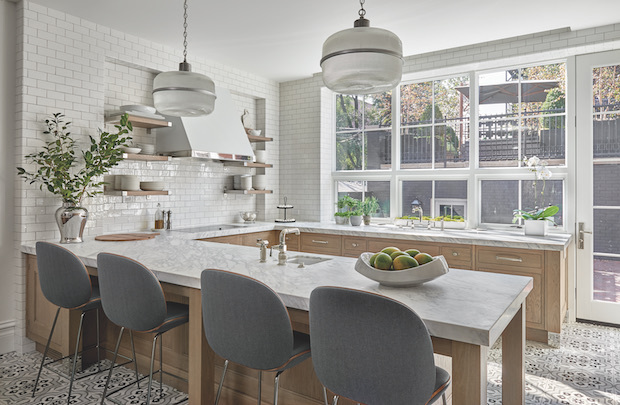 Ruppert, who works extensively in Washington, D.C., says that in most parts of the District, “Whenever you add on to a house, it has to ‘read’ as something completely different: separate and modern. The historic part of the home has to stand on its own; it’s the star of the show.” In San Francisco, neighbors and government officials favor Victorian architecture over new, says Schwartz, who is also a professor of architecture at the California College of the Arts, in Oakland. “Modern, progressive architecture is not seen as adding value,” he says. In San Francisco, Schwartz often finds himself in animated discussions with planning and zoning officials on the interpretation of seemingly subjective guidelines. Homes go through a historical design review, but obtaining a determination of whether a given house is a historical resource can add an additional four to six months to the process, he says. Schwartz observes that city officials and residents are often biased toward saving older buildings, no matter the cost, so he often finds himself in city hall offices to discuss design issues. Those discussions can be expensive. He once had an over-the-counter review of a retaining wall for his own home in San Francisco. The five-minute approval process racked up $3,800 in additional permit fees. Ruppert understands these frustrations. When two developers abandoned converting a 1920s car barn into two large homes because they tired of dealing with planning issues, he bought the car barn and did the conversion from scratch. Ruppert knew from previous experience working with the capital’s historic preservation review board that they would likely approve his work. He also made slight accommodations for neighbors. Chicago-based writer Mary Beth Klatt covers design and real estate. Comments on: "A Place in the City"